We tell our clients all the time “Content is King” and new content is even better. Useing Long Tail Keywords in your content clearly shows that the user is interested in learning about a specific topic. The following article gives detailed examples and how to’s for using Long Tail Keywords. What are long tail keywords and why are they important? Long tail keywords are specific, detailed search queries. These keywords usually have much lower search volume than short, broad keywords, but also much lower competition. They tend to demonstrate higher conversion rates as well. 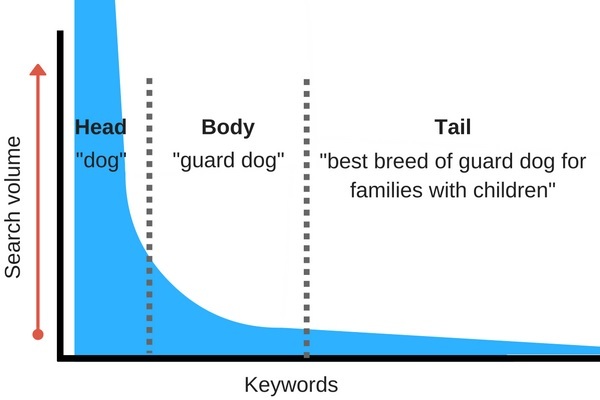 As you can see from the graph, the long tail keyword “best breed of guard dog for families with children” is searched much less frequently than “dog,” but it also demonstrates much more specific search intent. There’s a good chance the first two keywords are simply informational searches, while the long tail keyword clearly shows that the searcher is interested in learning about suitable dog breeds for their family. This is why long tail keywords are so important. Sure, the search volume is much lower, but for every user that you do attract based on a long tail keyword, there’s a much higher chance of them converting into a lead or sale.